One day when searching around google I came across some video about the “Rock-afire Explosion” After watching it I realized that “the band” seemed very familiar. They are a group of animatronic animals that play music. The origins of this story go back to Atari founder Nolan Bushnell. 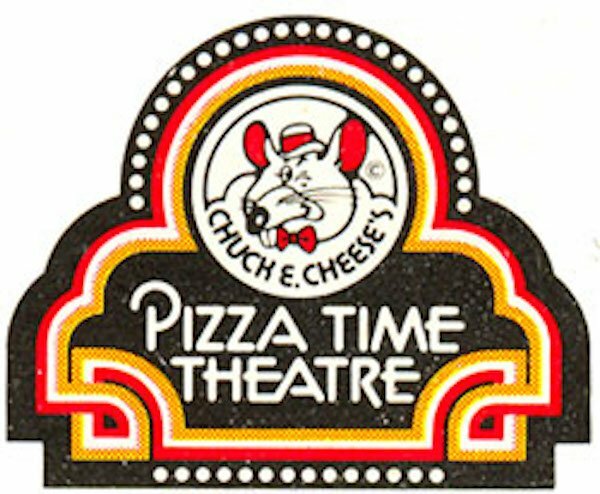 When selling off Atari to Warner Bros., Bushnell decided to found a new company in 1977, Chuck E. Cheese “Pizza Time Theatre” in San Jose, CA. It was the first family restaurant of its kind. 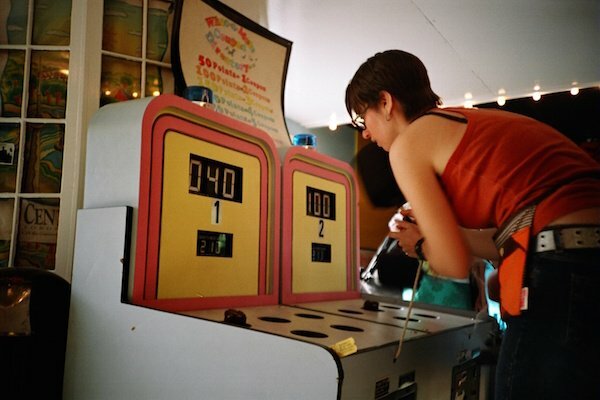 It merged food, arcade games and animatronics for entertainment. Over the course of the next few years, Chuck E. Cheese became more successful and Bushnell decided to franchise. In 1979, Bushnell reaches an agreement with Robert Brock (who at this point was a large franchisee of Holiday Inns) to open multiple locations across the Southern and Midwestern United States. That same year Brock meets Aaron Fechter of Creative Engineering, Inc. Just a quick fact, Creative Engineering created the WhackaMole game, alright now back to the story. This is very significant because Brock is so impressed with Creative Engineering’s animatronics that he asks Bushnell to release him from their agreement which he does. By the end of 1979, Robert Brock opens a competing attraction named ShowBiz Pizza Place which he co-owns with Creative Engineering, Inc (he’s actually got an 80% stake in the company). The first ShowBiz Pizza Place location opened its doors on March 3, 1980 in Kansas City, MO. It was here that the Rock-afire Explosion band were introduced to the world. Of course, this brings a lawsuit from Chuck E. Cheese’s company against ShowBiz Pizza in 1980 citing breach of contract with there being a countersuit citing misrepresentation. Over the course of the next few years, both companies expand often near each other. In 1981, Chuck E. Cheese’s parent company goes public. In 1982, the lawsuit is finally settled with ShowBiz Pizza required to give a portion of their profits to Chuck E. Cheese’s (approximately 50 million over the following 10 years). The next few years are extremely rough on the arcade business and Pizza Time Theatre (C.E.C.) files for Bankruptcy. In a crazy turn of events, ShowBiz Pizza purchases Chuck E. Cheese and assumes its debt. 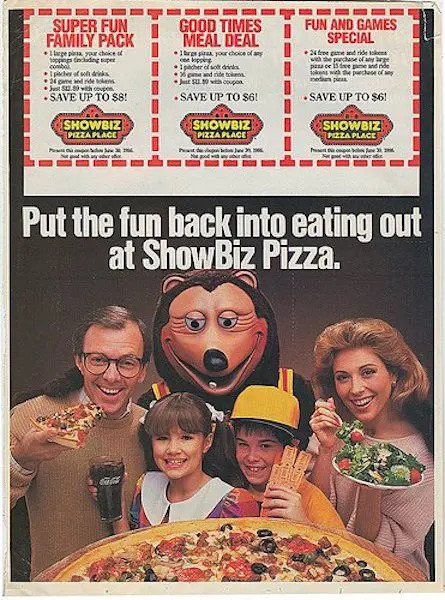 The new company is named ShowBiz Pizza Time. Both restaurants continue to operate separately while there is a financial restructuring going on that eventually leads in 1988 to ShowBiz Pizza Time going public. Just a few years later in 1990, Creative Engineering severs ties with ShowBiz Pizza Time. This is at roughly the same time when the company decides to unify their characters aka “Concept Unification”. 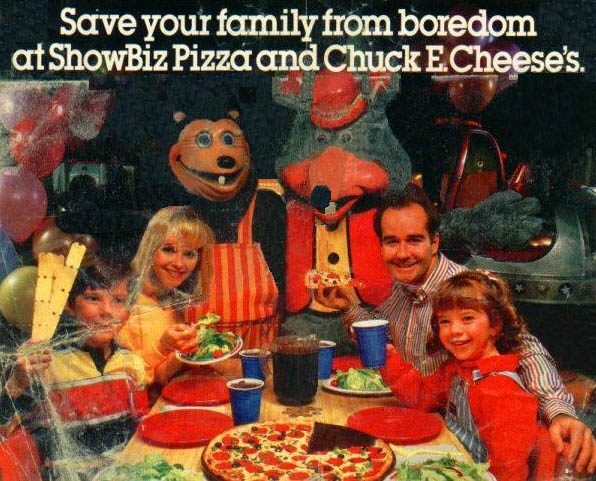 To save on costs associated with having 2 different sets of characters and locations to market, all ShowBiz Pizzas become Chuck E. Cheese Pizza. Since all ShowBiz Pizza characters were licensed from Creative Engineering, and all Chuck E Cheese characters were owned by the new company, it’s not hard to figure out what happened here. There are now over 500 Chuck E. Cheese locations and finally one fact I found funny. In 1997, it was officially announced that Chuck E. Cheese is a mouse and not a rat. Who knew? He stills looks a little rat-like to me. And whatever happened to the Rock-afire Explosion? They can still be found at some locations throughout the country, which I guess is how came across them. Oh man, in the eighties, Chuck E. Cheese's on 49th street in Hialeah was the best place my parents could ever take me. I remember playing Moon Patrol and Popeye until my hands were numb!! Does anyone remember how they had a sort of zip line thing that you could hang off of and then drop onto the big inflatable mats? Nobody ever seems to remember it but me. Thanks for the trip down memory lane el beasto, now how bout you send me one of them baseball caps? I'll wear it while I wear my "Oh the Horror" shirt, you can't get any better advertising than that!! I remember the zip line, but it was at Discovery Zone in Kendall (which is now Dandy Bear). I don’t know if they had the same things as Chuck E. Cheese; I never went there when I was little. I used to watch every move these guys made. I was sad seeing them go and being replaced by Chuck E.
I miss Showbiz-I really wish they would of stayed in business. 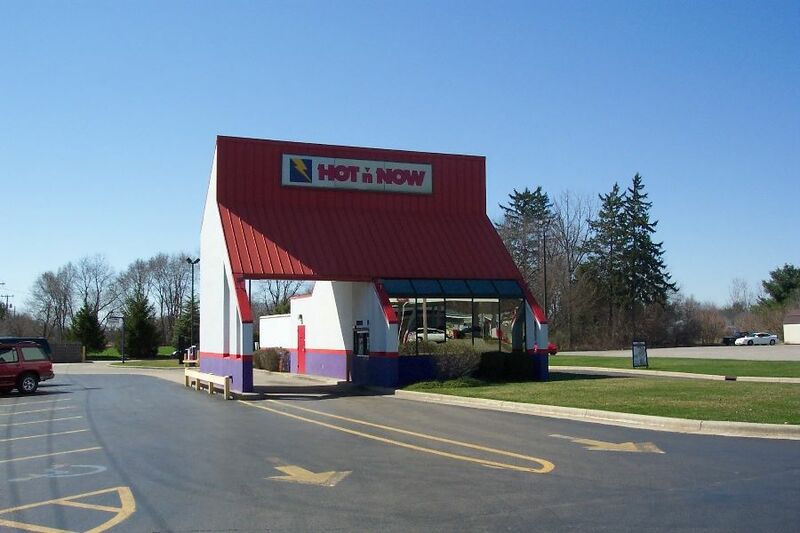 We had a Showbiz, which is now Chuck E. Cheese in Colerain, Ohio off US27. What I really miss are Rax and Burger Chef! Rax is still around in Ohio. There are a few located around the state, mostly south of Columbus. There are 2 in Lancaster and one in Circleville. As a tender youngster on a cold winter evening, I was treated to a school field trip to the Showbiz Pizza Place on 45th and State in SLC, followed, inexplicably, by a trip to the Capitol Theater to give us kids some culture or some such. This was around ’83. I don’t know if I’ve ever had such a fun time since. Good memories. Terrific article! I didn’t understand why the Showbiz folks decided to go with the CEC mythos until now, makes sense. By the way, Mr. Cheese will always be a rat to me! The “E” stands for Entertainment, you know.